SOKKS Drugs is completely harmless and requires no special handling, storage or requirements, you just need to be careful about cross-contamination as you would with any training scent. You can carry this training aid safely on you and train anywhere anytime, without leaving residual odour. SOKKS – Drugs can be planted and left in place without posting a guard, as it is completely safe to handle and poses no risk in case of accidental ingestion. SOKKS Drugs contains the equivalent of one gram of drugs dissolved in 80 million gallons of water. In these minute concentrations, the drug loses all of its pharmaceutical characteristics, yet it still exudes sufficient odour for canine detection training. SOKKS Drugs follows the same principle as the explosives system, with one exception. Whilst target odour is presented in its pure form, this system combines several odours in one training aid. Extensive research has shown that training the dog on all target odours each time is beneficial to the overall ability of the dog. This “combined” method of training has become the standard of all police, military stations and airports in Austria. SOKKS Drugs is completely harmless and requires no special handling or storage apart from the normal cross-contamination considerations. You can carry the training aids in the field and any time your schedule allows, without leaving residual odour (especially important when asking members of the public to carry a training aid). SOKKS Drugs can be planted and left in place without posting a guard as it is completely safe to handle and poses no risk in case of accidental ingestion. SOKKS Drugs is NOT PSEUDO! It is PURE ODOUR in minute quantities. Your dog will still detect larger quantities, only now he will be surer and faster in his response with increased drive and desire. 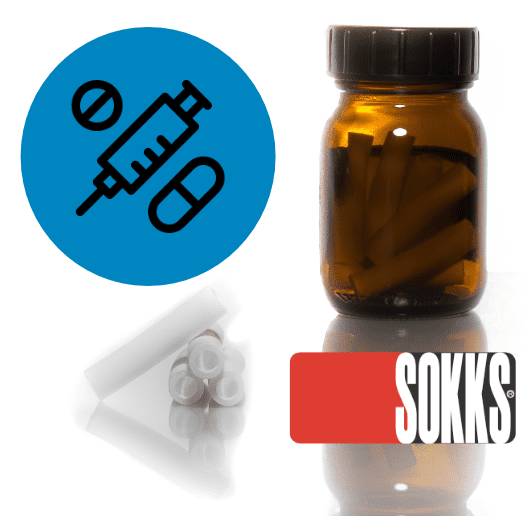 SOKKS Drugs is completely harmless and requires no special handling, storage or requirements, you just need to be careful about cross-contamination as you would with any training scent. You can carry this training aid safely on you and train anywhere anytime, without leaving residual odour. SOKKS Drugs can be planted and left in place without posting a guard, as it is completely safe to handle and poses no risk in case of accidental ingestion. SOKKS Drugs follows the same principle as the explosives system, with one exception. Whilst target odor is presented in its pure form, this system combines several odors in one training aid. Extensive research has shown that training the dog on all target odours each time is beneficial to the overall ability of the dog. This “combined” method of training has become the standard of all police, military stations and airports in Austria. SOKKS Drugs plus Paper Money is NOT PSEUDO! It is PURE ODOUR in minute quantities. Your dog will still detect larger quantities, only now he will be surer and faster in his response with increased drive and desire. A single SOKKS tube is completely non-toxic. It is absolutely safe for both the handler and the dog. If your dog swallows a SOKKS training aid, he is still in some danger of intestinal injury and should be seen by a veterinarian. Normally it should pass without any trouble. SOKKS K-9’s are trained on pure odour. We believe that in short order judicial notice will be taken of SOKKS. Each dog can still be certified using current state standards by using real products. However, since SOKKS uses the PURE ODOUR of for example REAL DRUG all current court decisions regarding the validity of training with real substances still apply.